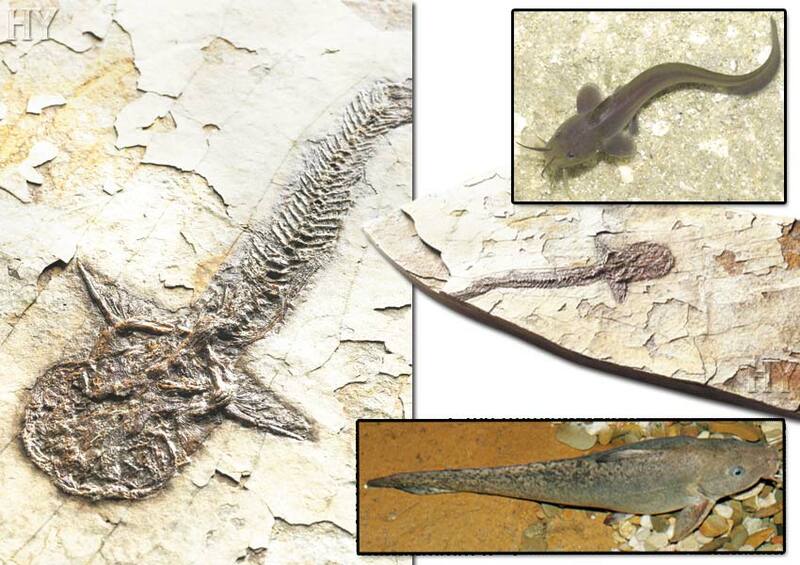 The 50-million-year old catfish in the picture has come down to the present day completely unchanged. Like all the other millions of fish created, this species never underwent evolution. 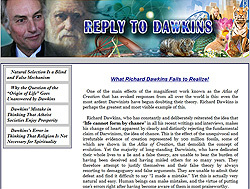 The transition from water to dry land alleged by evolutionists never happened. Like other life forms, the catfish looked and lived 50 million years ago the same as it does today. 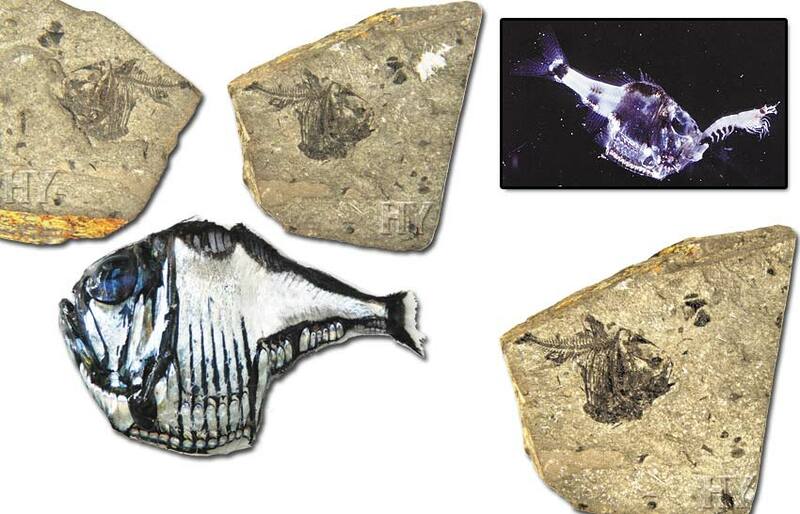 The fossil in the picture is a double aspect, negative-positive fossil. Like several other deep sea fish these small, bright, silver fish resembling hatchets in appearance have light producing organs beneath their stomachs. These fish have up to 100 light organs capable of emitting light beneath their bodies. The hatchet fish, which has lived in the seas for millions of years with this perfect creation, never developed out of any other life form and has never turned into another one. 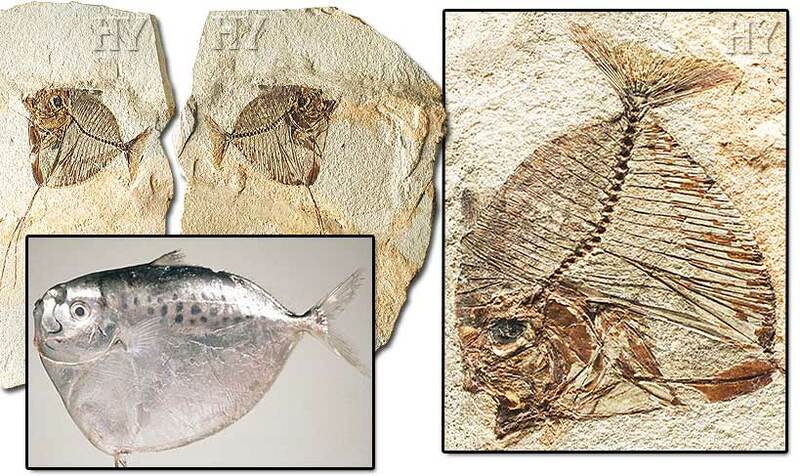 The 37-to-23-million-year-old hatchet fish from the Oligocene period in the picture was found in the Czech Republic and is identical to specimens living today. This fossil jellyfish, which dates back 500 million years and proves that these organisms have never changed up to the present day, is just one of hundreds of millions of fossils that clearly show the invalidity of evolution. 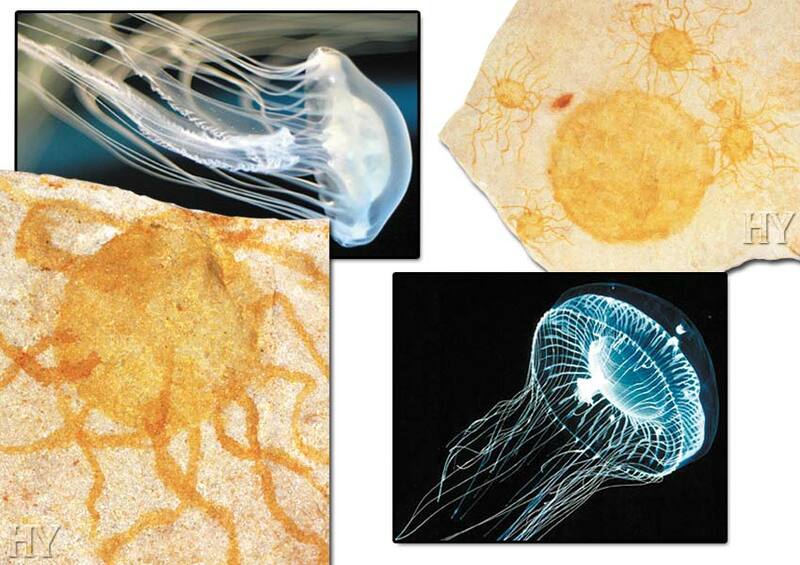 The way that the 500-million-year-old jellyfish in the picture has come down to the present day is quite literally a miracle because these marine organisms have no skeletons like fish do; theirs is a completely jelly-like structure. Under normal conditions this animal should have left no fossil remain behind it but Allah allowed this animal to be fossilized in order to invalidate evolutionists’ claims and has made it available as evidence from 500 million years in the past. Jellyfish have no hearts, brains, bones, scales or eyes. They have simply a loose network of nerves. Some species of jellyfish are poisonous. Those that are not poisonous possess the ability to emit light as the result of a chemical reaction, known as bioluminescence, for self defense. Just like all other life forms, jellyfish are manifestations of Allah’s glorious creative artistry. 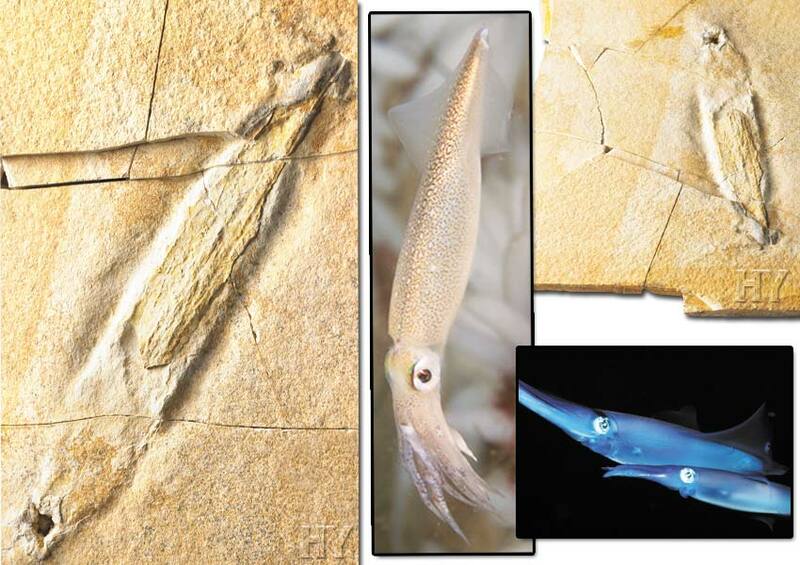 Like other created like forms, this 148-million-year-old opalescent squid has come down unchanged to the present day. 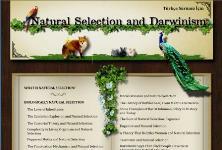 This is obvious proof that evolution never happened and that Allah creates all living things. The opalescent squid is one of the decapod family, and has 10 limbs protruding from its mouth region. Opalescent squids have highly sensitive senses of smell and taste. Their eyes are so powerful that with the vision they enjoy, by means of 70 million eye cells, they can immediately recognize a danger approaching from behind and perform a series of movements to protect themselves. Allah has given this animal a perfect defensive system. When attacked, the opalescent squid emits a dark-colored liquid from its ink sac, thus confusing the predator and allowing it to escape at high speed. The halfbeak has a long, beak-like jaw, conical in shape and equipped with powerful teeth. 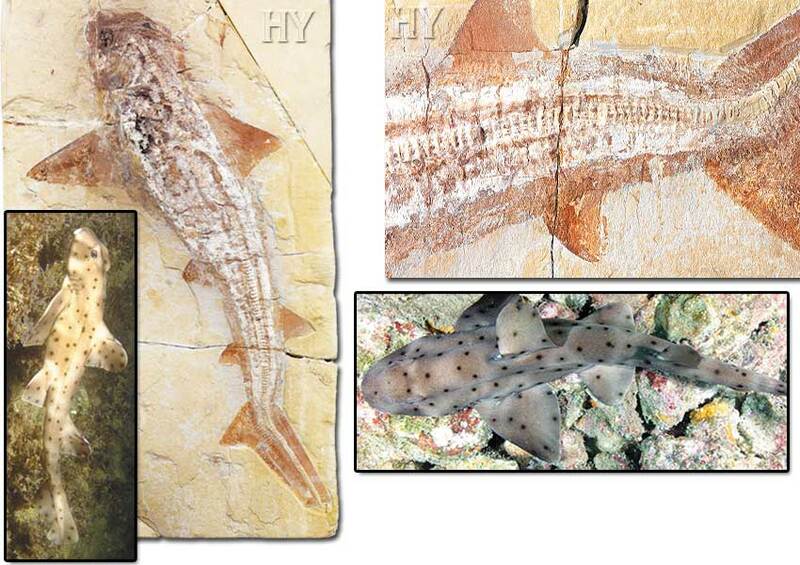 Comparison of this 150-million-year-old fossil discovered in Germany with specimens living today shows that the species has undergone no change in its appearance, nor any other changes in its bone and tail structure. Halfbeaks are one of the countless species that demonstrate the invalidity of evolution. Halfbeaks, the oldest known specimens of which date back to the Jurassic period (206-144 million years ago) have remained unchanged for millions of years. Corals are invertebrate organisms living in the depths of the sea. There are various types, such as soft, horn and thorny corals. When coral dries and solidifies it has a stone-like structure. Corals often resemble brightly colored flower gardens at the bottom of the sea. 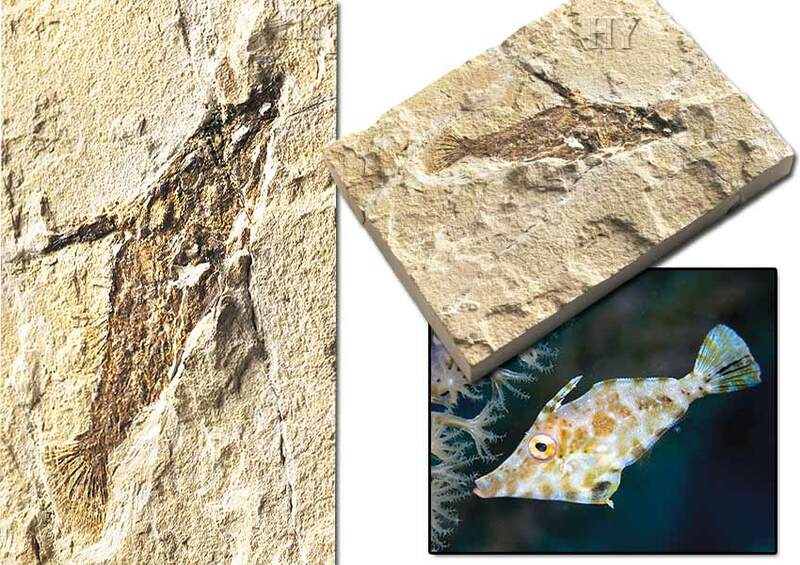 The 150-million-year fossil coral in the picture was petrified with all its details. 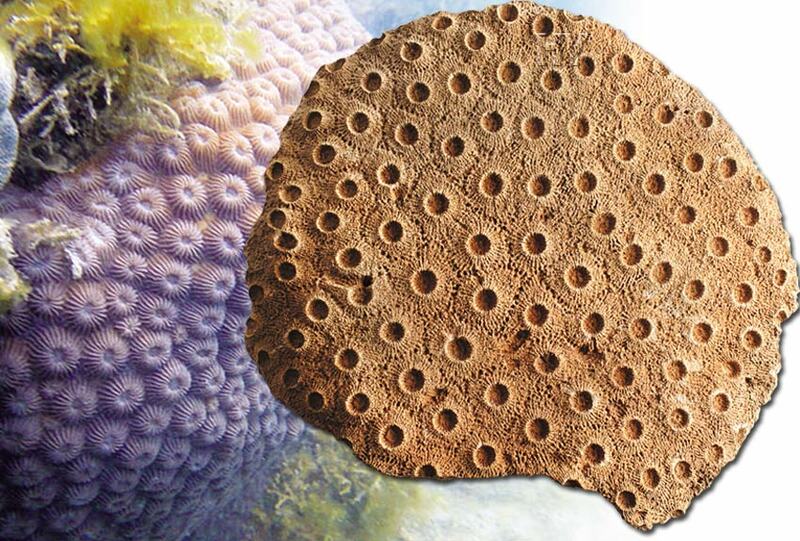 As can clearly be seen from the two pictures, this coral is identical to corals living today. This means that despite the intervening 150 million years, corals have never changed; in other words, they never evolved. 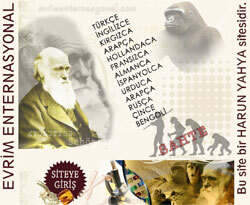 The fossil in the picture is a double aspect positive-negative one. 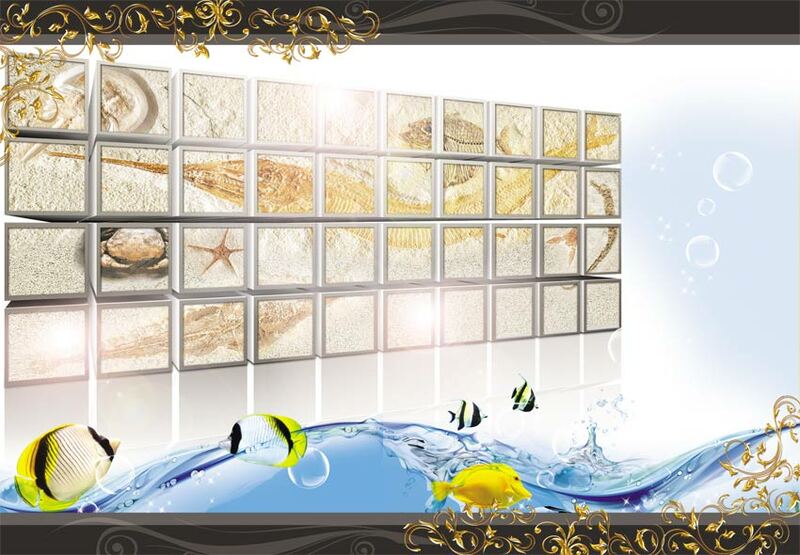 The fossil record is exceedingly rich and its numbers are sufficient for us to comprehend the origin of life. When we examine fossils we see that they appear suddenly, separately and with all their unique structures, with no supposed “evolutionary” “transitional forms” preceding them. 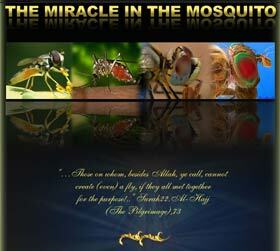 This is one of ” the proofs that Almighty Allah created all living things. 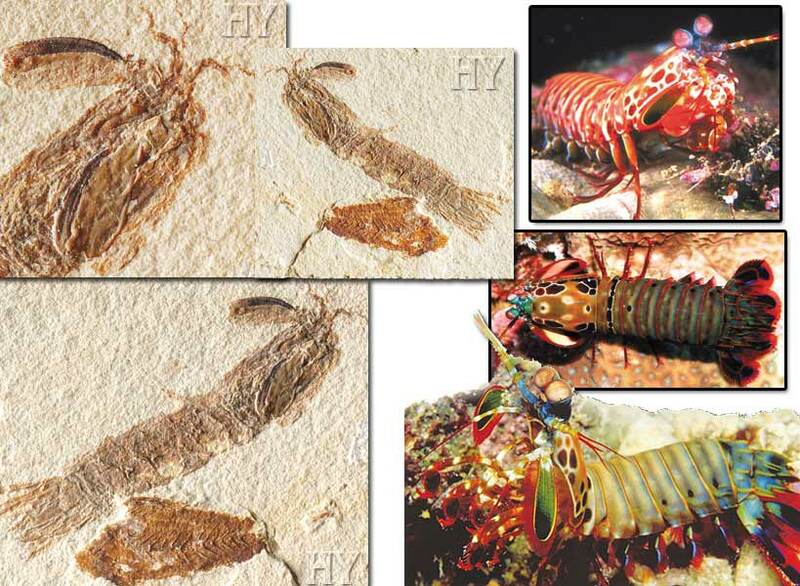 One of the fossils showing that Creation is a manifest reality is the 300-million-year-old lobster fossil shown in the picture. The details of the bodies of decapods, such as crabs, shrimp and crawfish, can also be clearly seen in this 300-million-year-old fossil. Like all other living things, this life form has remained the same since the day it was first created and has undergone not even the slightest change since. Present-day horn sharks have wide ridges on their long bodies. Examination of the 95-million-year-old fossil in the picture shows that the ridges on the body, and its head and tail structure have not changed in the least. The horn shark lives in the depths of the seas, and sometimes uses its pectoral fins to crawl over rocks. It lies in ambush for its prey in caves or reefs. It is approximately 1 meter long. 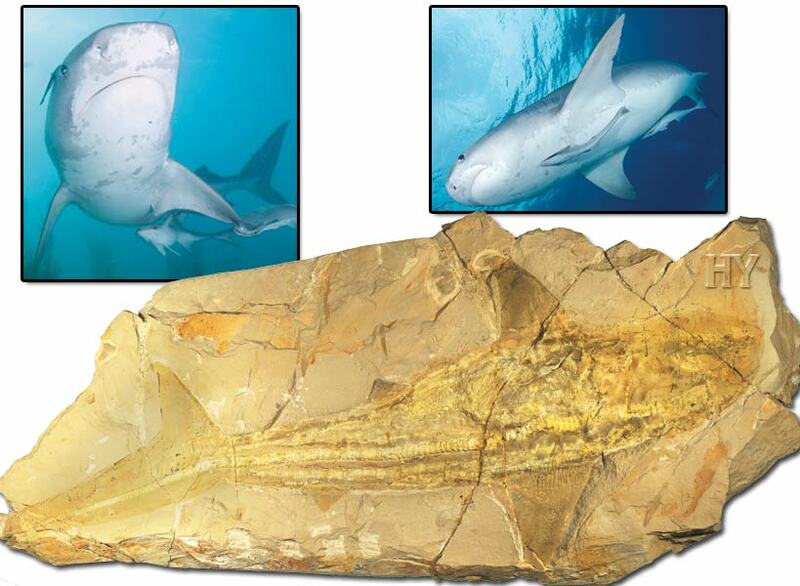 The 95-million-year-old horn shark in the picture illustrates once again the defeat suffered by Darwinists and proves the fact that our Lord creates all living things. 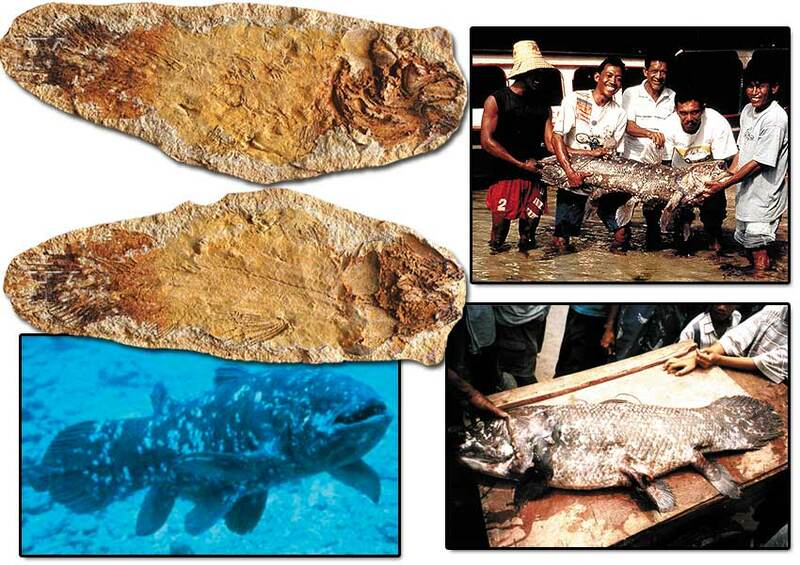 The discovery of a living coelacanth, a 210-million-year-old fossil specimen of which is shown in the picture, came as a severe blow to evolutionists. Evolutionist biologists seeking evidence for their theory of “a passage from water to land” had made highly irrational claims on the basis of the coelacanth. They suggested that the fish had a supposedly primitive (not fully functional) lung. This was described in a great many scientific references, and illustrations representing the coelacanth moving from water onto dry land were often published. Until 1938, many evolutionary biologists hypothesized that this life form used the two double fins on its body to walk along the sea bed and was a transitional form between marine and terrestrial animals. 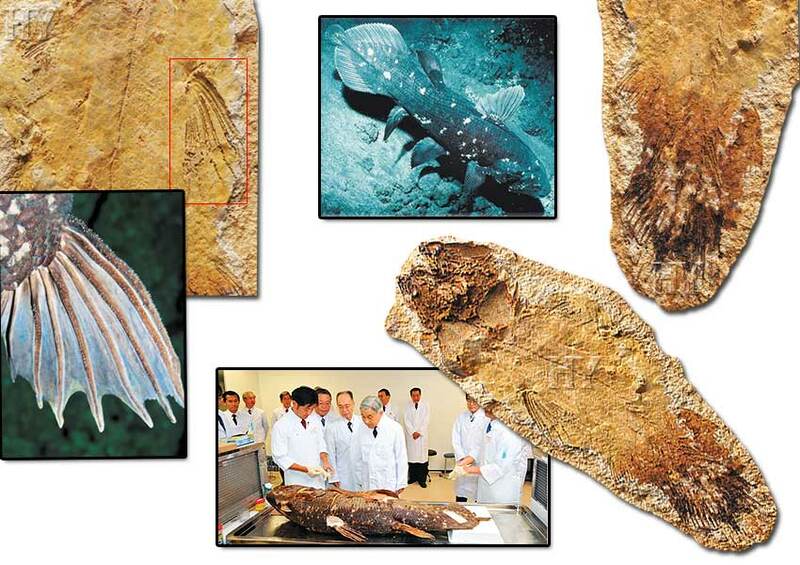 As evidence for these claims, evolutionists pointed to the bony structures in coelacanth fossil fins. However, an event in the Indian Ocean on December 22nd 1938, totally demolished that idea. A living member of the Latimeria species, one of the coelacanth family, which had been depicted as a transitional form that had become extinct 70 million years earlier, was caught in the middle of the ocean! The discovery of a “living, breathing” coelacanth came as a huge shock to evolutionists. In addition, examination of the animal, thought to have disappeared 70 million years in the past, showed that coelacanths had never changed over 400 million years. More than 200 coelacanths, a species which evolutionists had declared long extinct, were caught in the years that followed in other regions, especially in 1939 in the mouth of the Chalumna River and off the coast of Madagascar, and in the seas off the Comorra Islands in 1952 and 1953. The catching of these fish exposed just how far the fictitious speculation by evolutionist scientists could go. Coelacanths had neither a primitive lung nor a large brain. 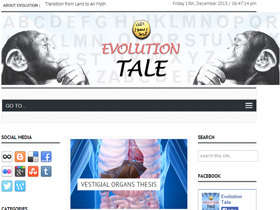 The structure that evolutionist researchers thought was a primitive lung was nothing more than a fat sac in the fish’s body. Moreover, contrary to what had been claimed, the fish did not possess a large body. While it had a large skull, there was only a small brain inside it. The idea of the only serious contender for the role of a “transitional form” between fish and amphibians was thus eliminated. At this, the popularity of the coelacanth in evolutionist publications came to a sudden end and the coelacanth was hastily taken out of textbooks where it was presented as a supposedly transitional form. Sardines are nomadic fish that travel in schools, in deep water in winter and moderately deep water in summer. They are 15 cm (6 inches) long on average, with a maximum length of 20-22 cm (8.3 inches). These fish are often found in the Black Sea, Marmara, Dardanelles and the northern Aegean. The picture shows a 95-million-year-old fossil. As with all other living things created by Allah, this life form has never changed since it was first created and deals a severe blow to the theory of evolution. 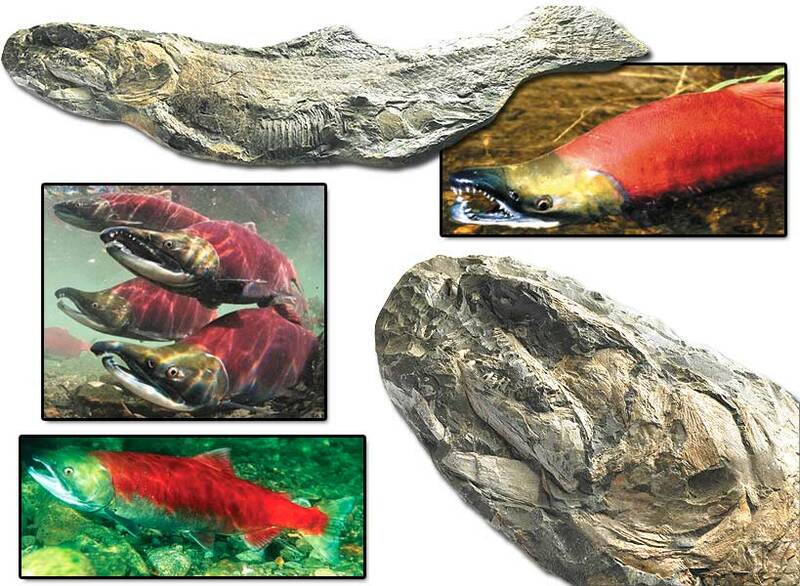 The picture shows a 110-million-year-old Cretaceous period sockeye salmon fossil discovered in Brazil. Paleontology has proved that there is no difference between life forms that existed millions of years ago and living specimens today. 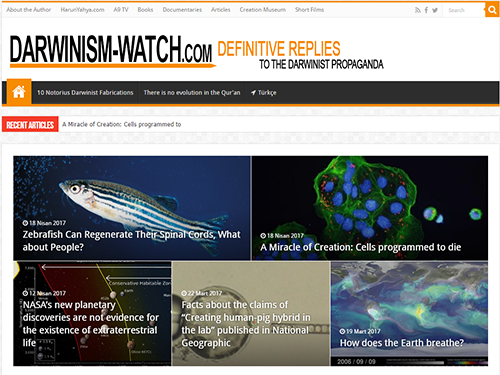 Millions of fossils proving creation have now made it impossible for scientists to defend the theory of evolution. Salmon are specially created by Allah. As soon as they hatch, salmon embark on a long migration to the sea. Chum salmon reach the sea after feeding for a few weeks, while Kin and Atlantic salmon reach it after completing their development over a period of one to three years. On their first migration, young salmon travel along the river they find themselves in; as they mature on this journey to the sea, they face dangers such as polluted water and larger fish waiting to catch them. Those that escape these dangers and reach the sea complete their migrations. After spending a few years in the sea, they grow and their reproductive organs reach maturity; they then embark on an amazing journey. The first amazing fact on this journey is the length of the migration that fish undertakes. Salmon in the open sea have to swim thousands of miles in order to reach their objectives. For example, when the time comes for a Chum salmon to lay its eggs in the fall, it swims for more than 3,200 miles (5,150 km) along the Yukon River. Like all other living things, salmon behave as they are inspired by Allah and reveal the majesty of His creation. 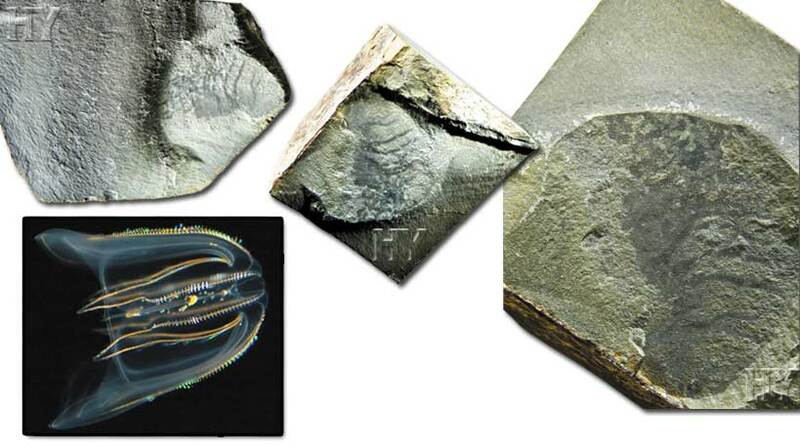 The picture shows a 525-million-year-old Cambrian period comb jelly. The reason why these animals, whose scientific name is ctenophores, are known as comb jellies is that they possess eight lines of cilia. What differentiates comb jellies from other species of jellyfish is that they lack the venom-filled organ known as the nematocyst, which resembles a curved tube. The biological phenomenon known as bioluminescence can be seen in the majority of jellyfish and ctenophores. This enables the organism to put on a wonderful sound and light show in the depths of the sea. There is no doubt that this characteristic has been given to this animal by Allah since it was first created by Him. This fossil, showing the appearance of this life form 525 million years ago, proves the invalidity of the theory of evolution. 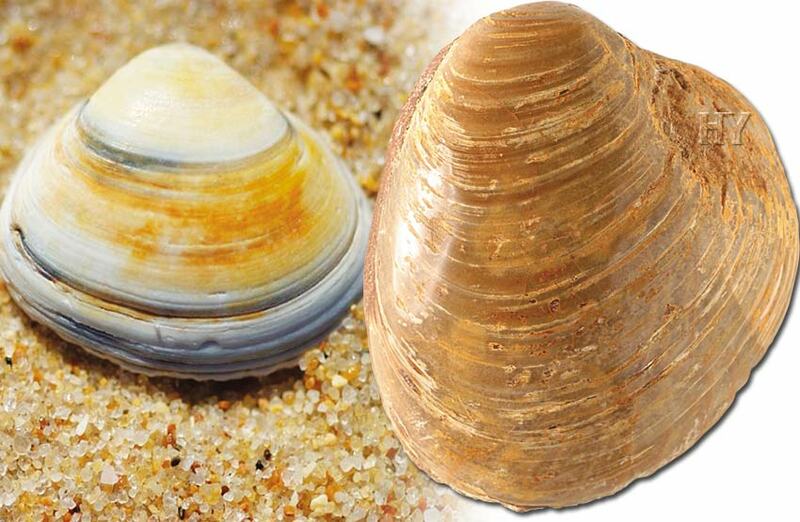 A look at this 206 to 144-million-year-old bivalve fossil found on the island of Madagascar shows that it is identical to specimens of the life form living today. Bivalves can be observed in fossils right down to the finest details and the stripes running down them. As you can see, not the slightest change has taken place in this life form, despite the passage of 144 million years, and it has never evolved or turned into another life form. 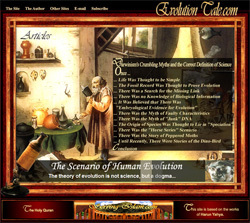 The fossil science and paleontology that made such advances in the 21st century have completely demolished the theory of evolution and revealed the fact that life forms do not gradually turn into one another. A lobster, an octopus, a squid and millions of other such species looked exactly the same 150 million years ago as they do today. 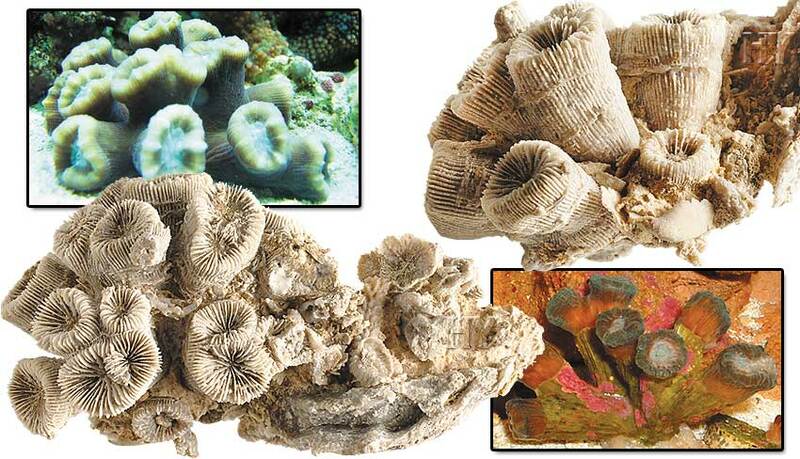 The coral in the picture has never changed, despite the passing of 350 million years. There are various types of coral, such as soft, hard and horn. Sea anemones are also a member of this class. Coral is the name given to the rocky skeletons of these life forms mixed with mineral substances. As a result of coral skeletons collecting in a specific region over thousands of years, coral reefs come into being. This exceedingly beautiful life form reflects the artistry of Allah. Tiger sharks have a plump, cylindrical appearance and are some 3.5 meters (11.5 feet) long. They live alone and hunt many marine creatures. They even attack other species of sharks. The tiger shark takes its name from the dark stripes on its back, which disappear with age. The details of the skull and fins and the skeletal structure can clearly be seen in this 95-million-year-old fossil. 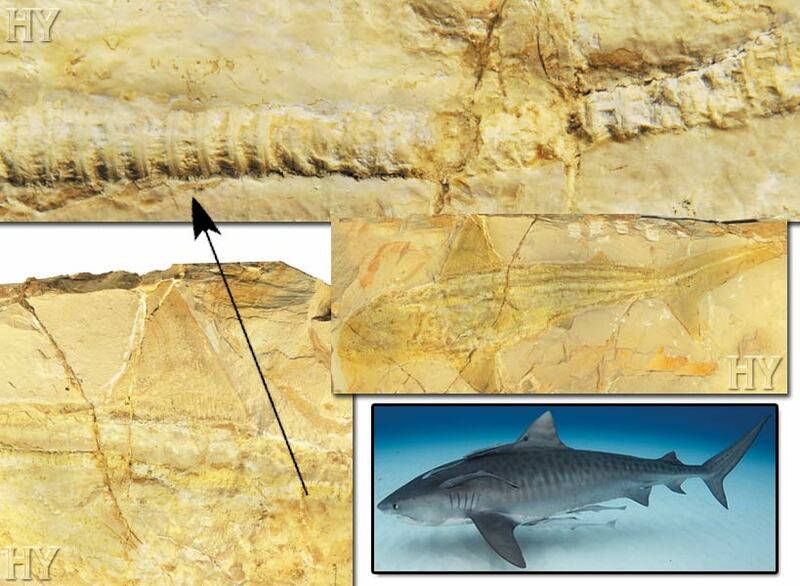 As tiger shark fossils prove, living things never evolved. Allah created all living things. These living fossils are identical to specimens living today and are therefore evidence holding up a mirror to the fact that species have never evolved over many millions of years. This means they deal a lethal blow to the theory of evolution. 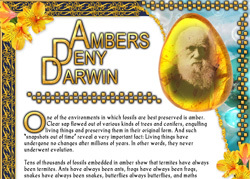 The theory of evolution claims that only living things that can adapt to changing environmental conditions will ultimately survive, and that during this process, which takes place under the effect of various fictitious random changes, they evolve into other life forms. Living fossils, however, reveal that the theory’s idea that species will change over the course of time in line with changing conditions consists of a groundless myth. 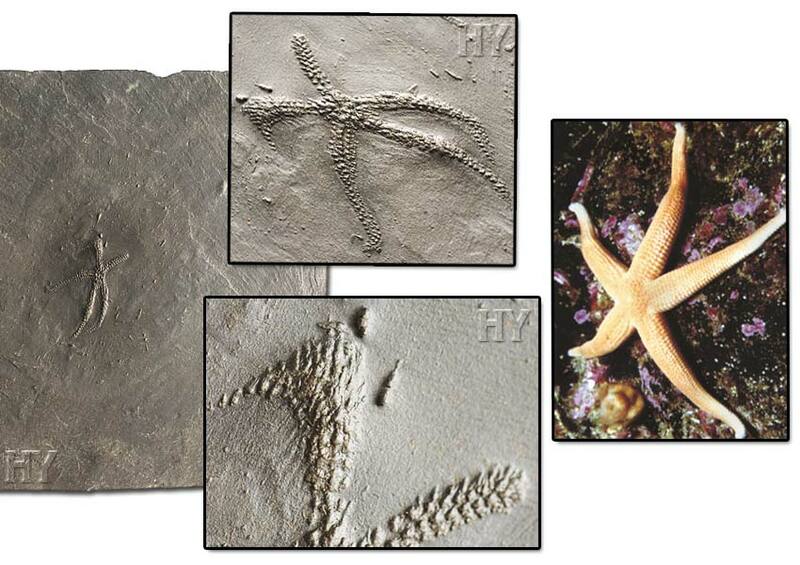 There are living fossils going back hundreds of millions of years. Living fossils such as the tiger shark, which have never changed despite going back some 400 million years, and the coelacanth, which evolutionists portrayed as an extinct transitional form, but which was later realized to be a bottom dwelling fish still living today, represent a very striking picture that totally discredit the scenario of change in the theory of evolution. The opalescent squid is a member of the Cephalopoda class, from the Decapodiformes group. It lives in the sea and has survived right down to the present day. The opalescent squid has always existed as the opalescent squid. It is not descended from any other life form and never turned into another one. 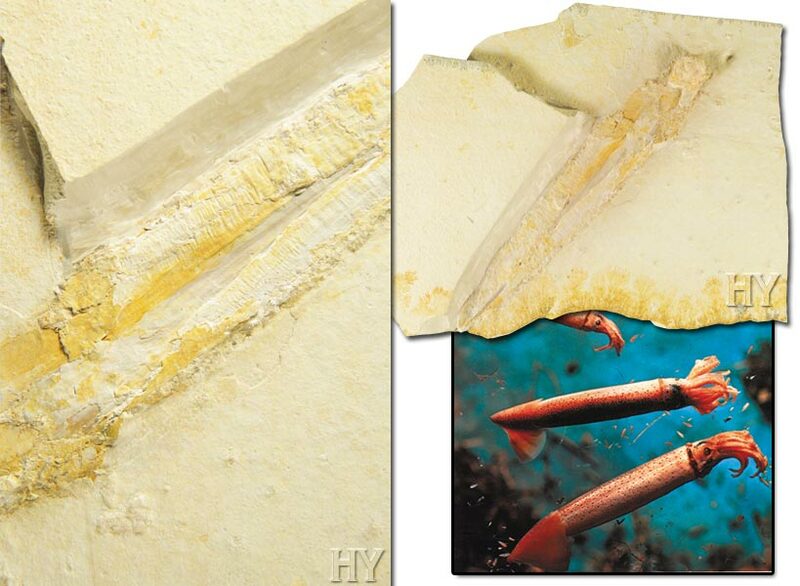 Fossil findings that confirm this say that, like all other life forms, opalescent squid have never evolved. Opalescent squid protect themselves by squirting out ink that Allah has bestowed in their bodies at moments of danger, and they also exhibit a perfect camouflage technique. The barracuda is a carnivorous fish that lives at depths of up to 100 meters (300 feet) in all hot and warm seas. They travel in schools and are exceedingly aggressive and voracious. They are even known to attack sharks. 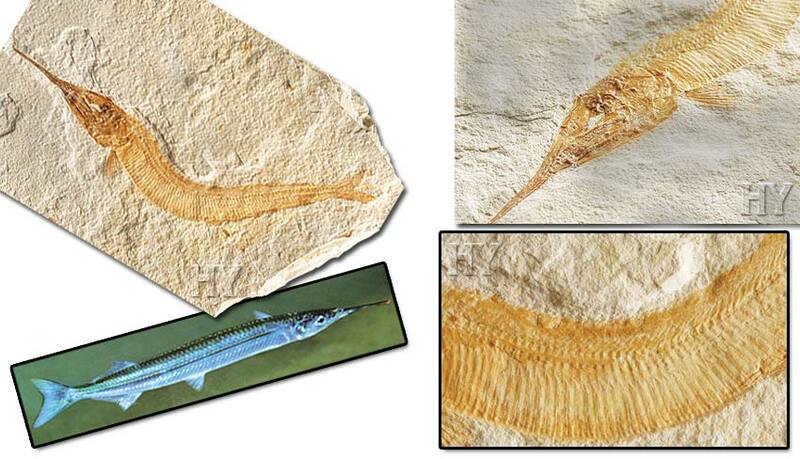 A Miocene period barracuda fossil dating back five million years and discovered in Italy clearly exhibits the small fins immediately beneath the head and on the tail, its delicate and long skull structure and its long body. 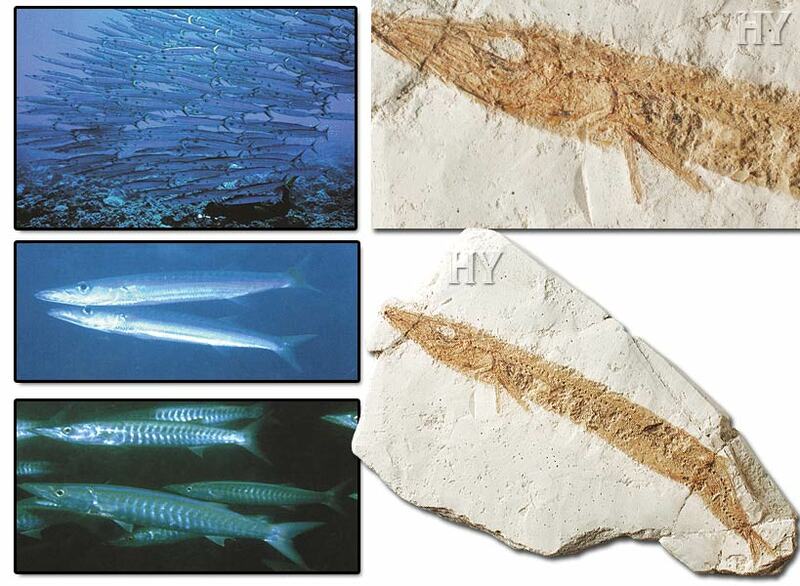 All these details prove that despite the intervening five million years, the barracuda has never changed; in other words, that it never evolved. Mantis shrimps, which have come down unchanged ever since the Carboniferous Period (354 to 290 million years), are another life form that refutes the theory of evolution. 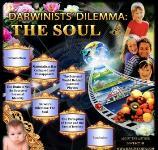 The fact that a life form never changes over 300 million years is not something the evolutionist logic can explain. 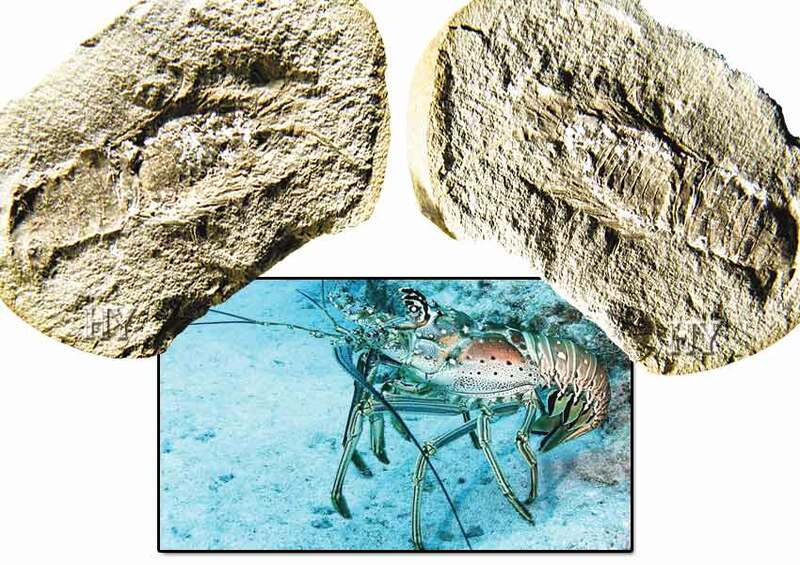 The mantis shrimp fossil in the picture is 95 million years old and is identical both to mantis shrimps that lived 300 million years ago and also to those living today. The mantis shrimp can reach up to 30 cm (12 inches) in length and has a shell of different colors. Divers refer to them as “finger snappers” because of their dangerous claws, and they possess one of the most complex eyes in the animal kingdom. The mantis shrimp can see twelve main colors, four times as many as human beings, and can also identify the direction of the vibrations occurring in different light waves. These are some of the typical and identifying characteristics of the Mene maculata, which has never changed over millions of years. The fossil record is literally a picture of how these fish looked millions of years in the past, and shows that they have never changed. The mene maculata fish, a member of the Menidae family, is mainly found in the waters of the Pacific Ocean. Many fossil remains of this life form from the Cenozoic period (65 million years to the present) have been found. The 54 to 37-million-year-old fossil in the photograph from the Eocene period is important evidence that this life form has never changed in any way. The fossil is identical in every way to members of the species living today, with its broad body, small tail, skeletal structure and the two long fins extending from beneath its body. 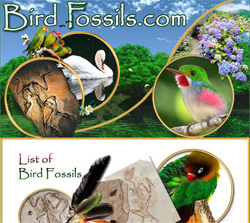 The fossil record literally reflects a picture of how living things were millions of years in the past. If a life form has not altered in the slightest over tens of millions of years, then it is impossible to speak of these living things evolving. The way that animals with no shells or vertebrae appear in the fossil record, together with all their details, is truly a great miracle of Allah’s. 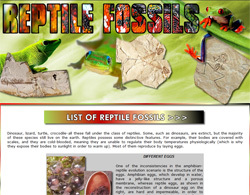 These animals’ heads, arms and eye sockets can clearly be seen in fossils. In this way, people can witness the fact that no life forms ever change by seeing the fossil records for all living things created by Allah. The octopus is a member of the cephalopod class. Their bodies are short and round. They have a pair of highly developed eyes. Eight arms emerge from around their heads. These arms are all of the same length and are connected to one another at the bottom by a thin membrane. There are two rows of suckers on each arm. 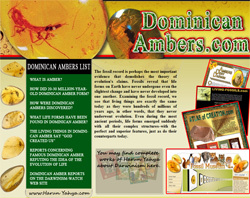 Different species vary in size from two to three cm to 10 meters (one inch to 30 feet) in length. They move across the sea bottom by crawling along on their arms, or can also move much faster using a jet system to emit the water they absorb into their bodies at high speed. Octopi also have an advanced ability to change color, which enables them to conceal themselves with ease. They open mussel and oyster shells, place a stone inside to prevent the shell from closing again, and consume the contents. Since they have no shells, they can flatten their bodies and arms and squeeze into very tight spaces. Like other life forms, the octopus is the work of Allah’s magnificent creation. Evolutionists claim that fish evolved from invertebrate marine organisms, amphibians and modern-day fish from a supposed “ancestral” fish, reptiles from amphibians, birds and mammals from separate reptiles and, finally, human beings and monkeys from a common ancestor. 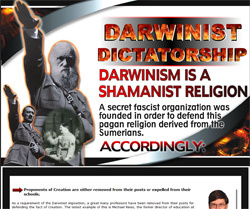 However, not one single transitional form that might corroborate that claim has ever been found in the fossil record. 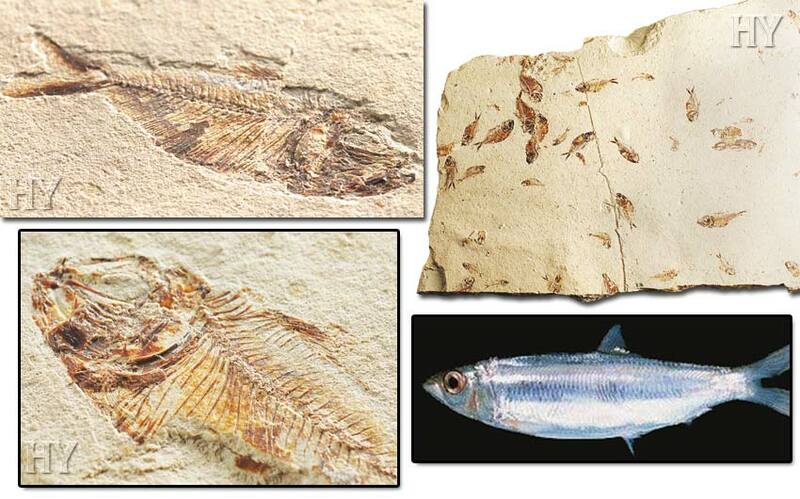 The 95-million-year-old fossil file fish shown on this page is identical in every respect to specimens alive today. Therefore, like all other species, this life form has never changed in the least over millions of years, and never evolved. 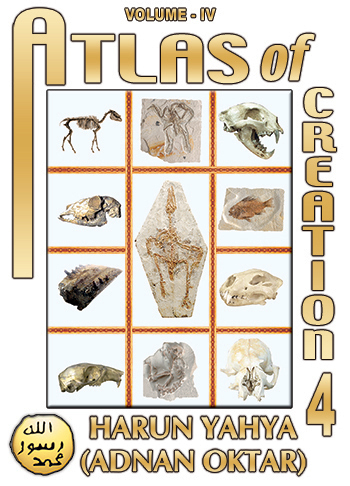 Every fossil discovery proves that the theory of evolution never happened and that all living things are created by Allah in all their perfect forms. 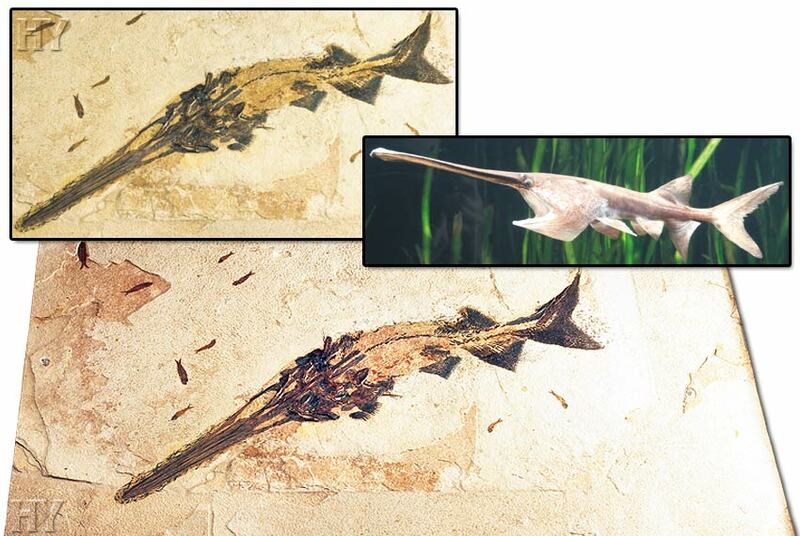 There is no difference between the Eocene Period, 50-million-year -old paddle fish in the pictures and a present-day specimen. The fish’s paddle-like mouth and unique fins remain just as they always have. 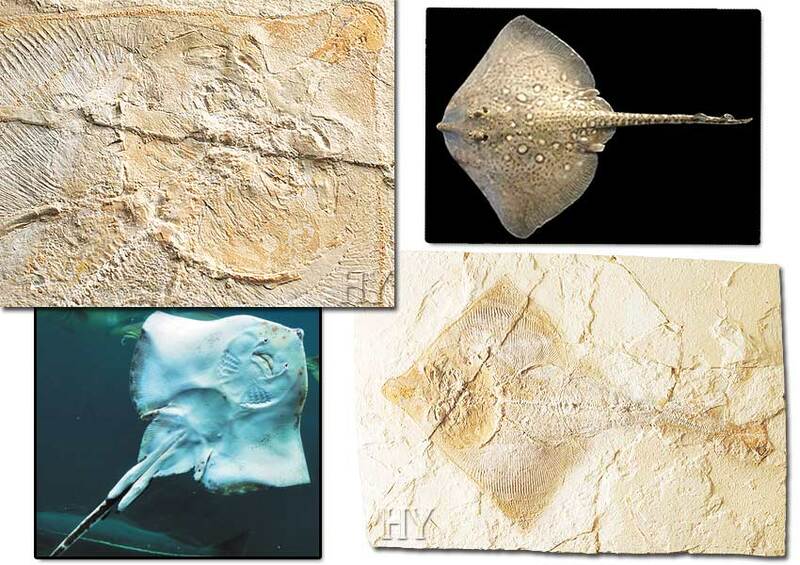 Fossils of this kind show that life forms did not evolve, but that Allah created them all, perfectly and in a single moment. The thornback ray is a member of the family Dasyatidae and is unique to the northeast Atlantic and the Mediterranean. It inhabits a very wide region, from Madeira and Morocco to the British Isles, from the south of Norway to the Baltic, and from the Atlantic to the Mediterranean and the Black Sea. Its nose is short and broad. The front part of its body is quite smooth. The rear part, on the other hand, is curved slightly upward. The tail is on average 1.4 times the length of the body. There is a poisonous spike on its tail. Examination of this fossil that lived 95 million years ago shows that it is physiologically identical to a specimen alive today. Despite the passage of millions of years, the fish has preserved its long, thin tail structure and body that opens out to the side in two wings, and it has never altered in the slightest. 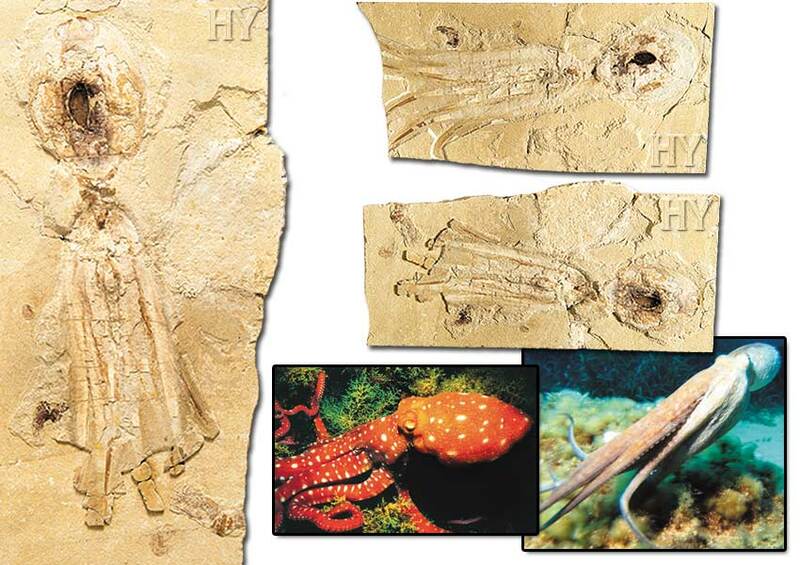 A 95-million-year-old thornback ray proves that living things did not evolve and that Allah creates all life forms.